The Newkirk Plain is part of the Clarks 1825 Collection. 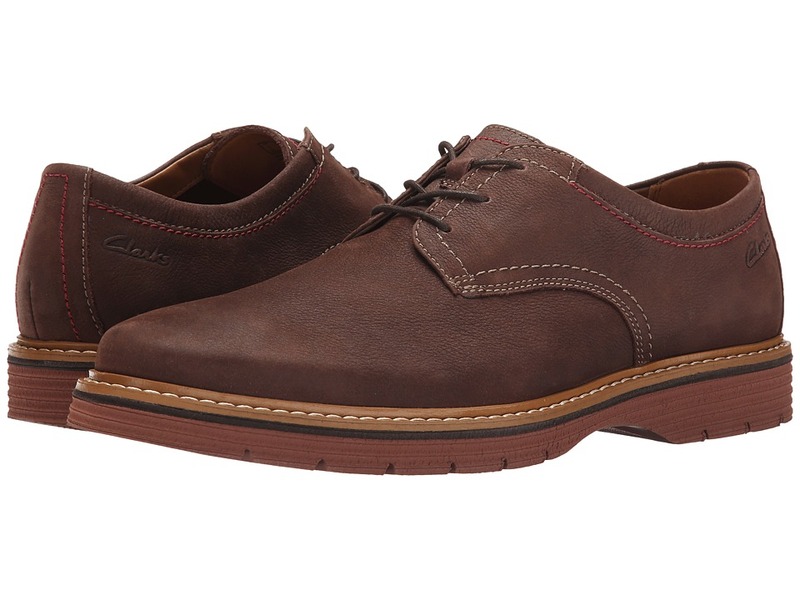 Here is a fresh take on a casual favorite by Clarks! Premium nubuck upper with contrast stitching details. Lace-up closure for an adjustable fit. Soft fabric lining. Cushioned Ortholite footbed. Extralight&amp#174 sole give great comfort, flex and durability. Imported. Measurements: Weight: 13 oz Product measurements were taken using size 8, width D - Medium. Please note that measurements may vary by size. Weight of footwear is based on a single item, not a pair. The Keesha Luca is part of the Clarks Artisan Collection. Commute to your destination in chic comfort and style with the Keesha Luca slip-on from Clarks. Leather, patent leather, or tweed wool upper. Easy slip-on style. Breathable synthetic lining. Clarks Plus intelligent underfoot cushioning with a removable OrthoLite molded footbed for optimal comfort. Durable rubber outsole. Imported. Measurements: Heel Height: 1 in Weight: 8 oz Product measurements were taken using size 7.5, width B - Medium. Please note that measurements may vary by size. Weight of footwear is based on a single item, not a pair. The Keesha Rosa is part of the Clarks Artisan Collection. Be this season~s fashion-forward influencer in the graceful Keesha Rosa from Clarks. 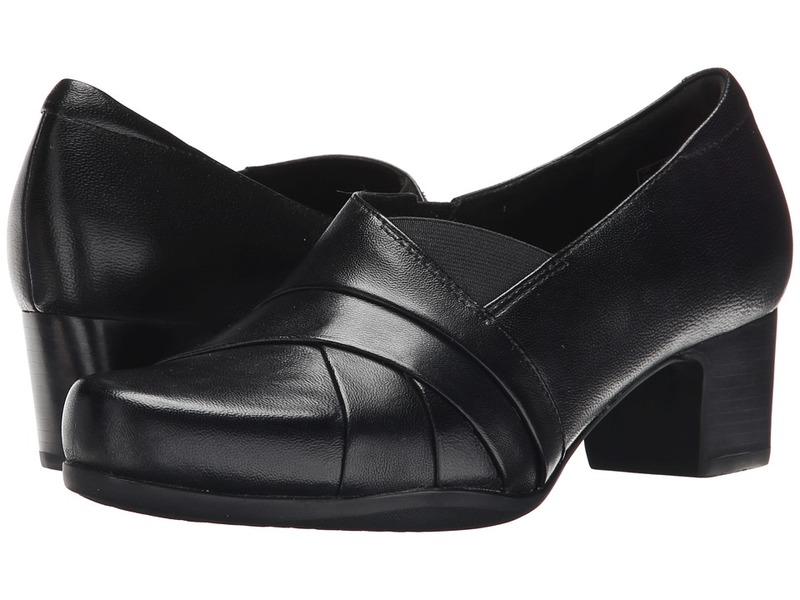 Leather or synthetic fabric upper with a patent leather toe. Easy slip-on. Soft synthetic lining. 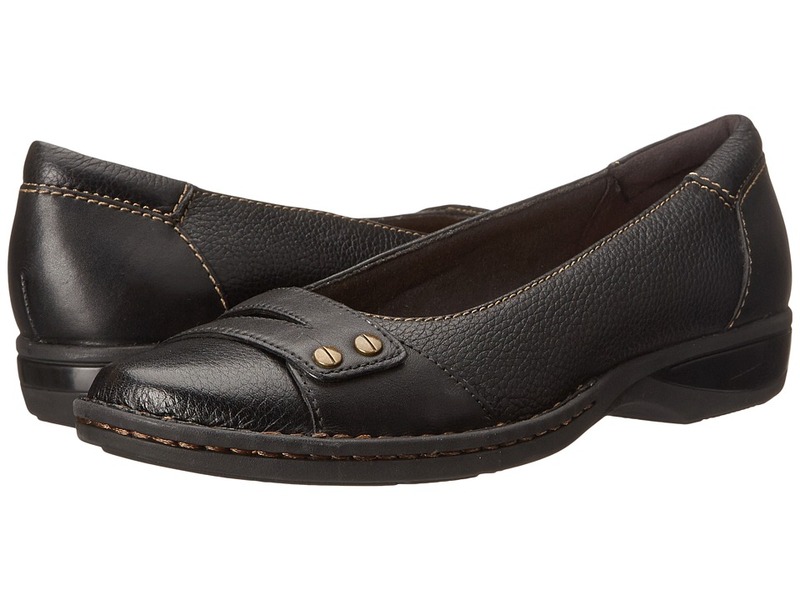 Removable Ortholite footbed provides optimal comfort. Clarks plus technology. Durable rubber outsole. Imported. Measurements: Heel Height: 1 in Weight: 8 oz Product measurements were taken using size 8, width B - Medium. Please note that measurements may vary by size. Weight of footwear is based on a single item, not a pair. 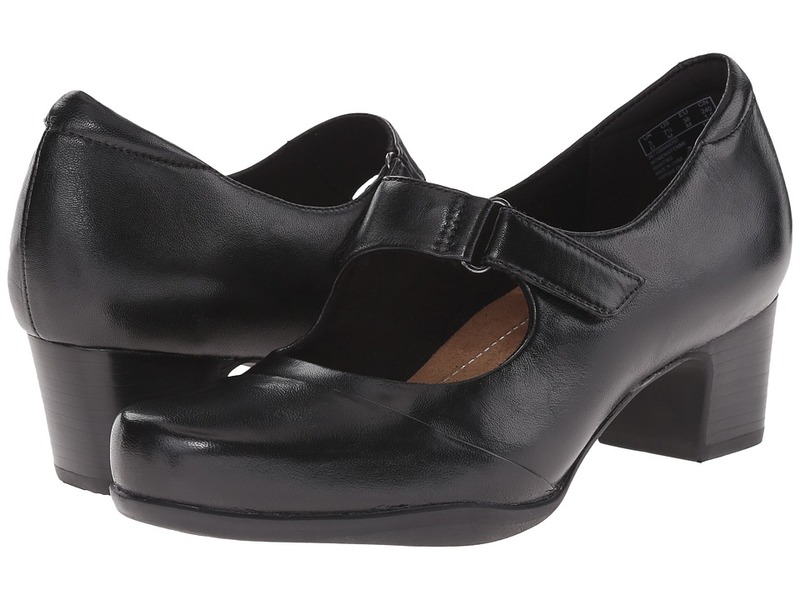 Please note: Rosalyn Adele is Clarks update to the Sugar Spice. The Rosalyn Adele is part of the Clarks Artisan Collection. Project your seasonal staple with the ravishing Rosalyn Adele pump. 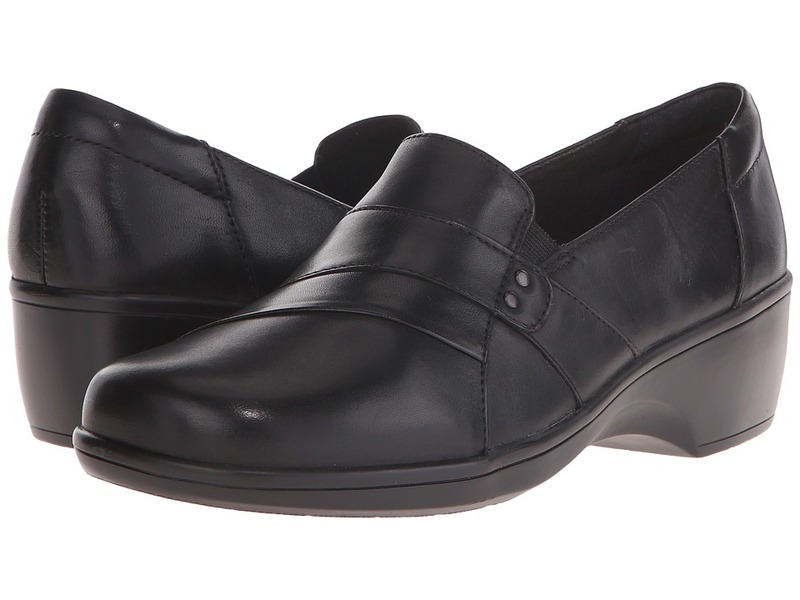 Leather upper with elegant pleating details. Easy slip-on with goring for a comfortable fit. Soft synthetic lining. Cushioned Ortholite footbed provides optimal comfort. Clarks plus technology. Durable rubber outsole. Imported. Measurements: Heel Height: 1 3 4 in Weight: 11 oz Product measurements were taken using size 8, width B - Medium. Please note that measurements may vary by size. Weight of footwear is based on a single item, not a pair. Please note: Rosalyn Belle is Clarks update to the Sugar Plum. The Rosalyn Belle is part of the Clarks Artisan Collection. 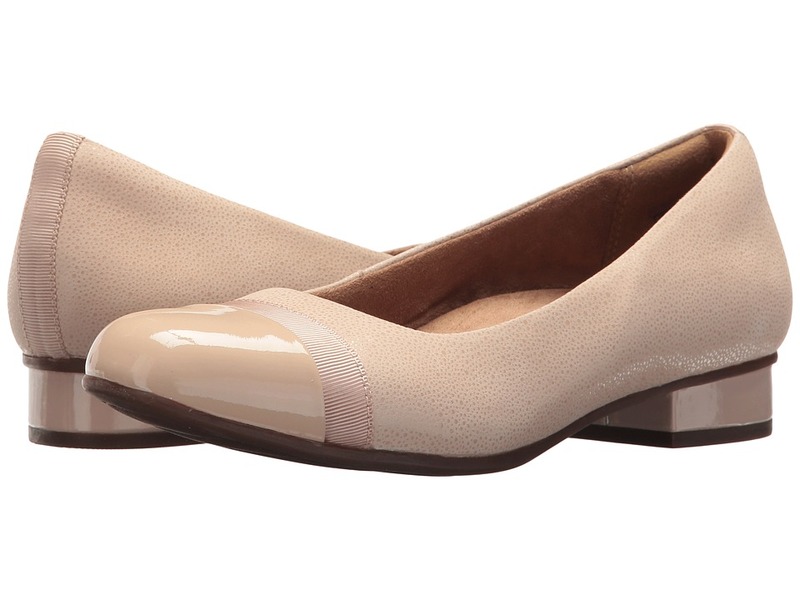 Pamper your foot with rich comfort and classic style in the Rosalyn Belle pump by Clarks. Leather upper. Easy slip-on style. Soft synthetic lining. 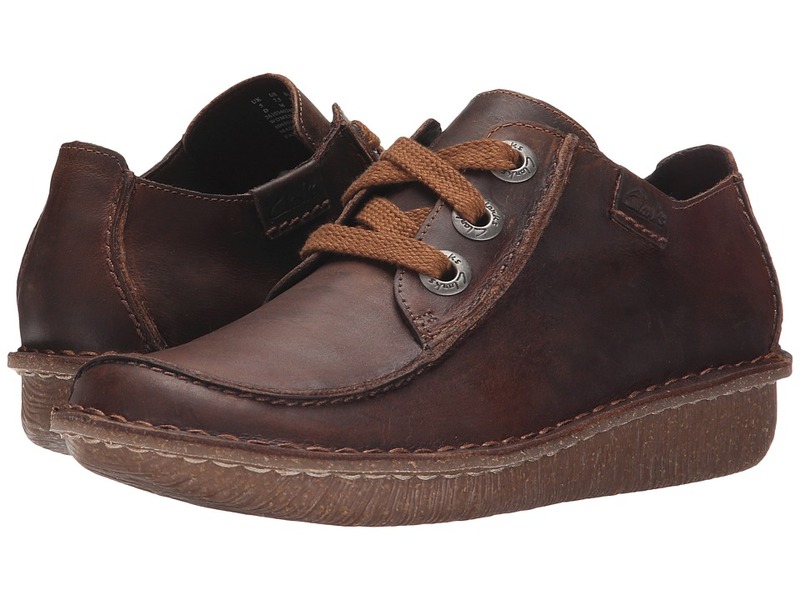 Clarks Plus intelligent underfoot cushioning and OrthoLite&amp#174 footbed. Leawood block heel sits atop a durable rubber outsole. Imported. Measurements: Heel Height: 2 in Weight: 15 oz Product measurements were taken using size 9, width D - Wide. Please note that measurements may vary by size. Weight of footwear is based on a single item, not a pair. Please note: Rosalyn Wren is Clarks update to the Sugar Palm. The Rosalyn Wren is part of the Clarks Artisan Collection. Super versatile with a touch of classiness. Soft leather upper. Hook-and-loop strap for an adjustable fit. Smooth synthetic lining. Clarks Plus intelligent underfoot cushioning with OrthoLite molded footbed. 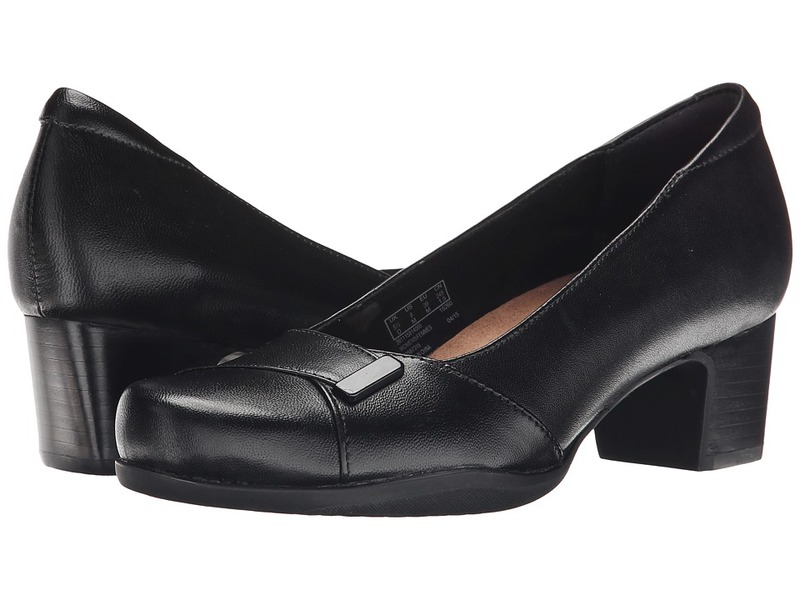 Leawood block heel. Durable rubber outsole. Imported. Measurements: Heel Height: 1 3 4 in Weight: 10 oz Platform Height: 1 4 in Product measurements were taken using size 8.5, width D - Wide. Please note that measurements may vary by size. Weight of footwear is based on a single item, not a pair. The Petula Sadie is part of the Clarks Artisan Collection. Casually fancy is the way to go in the Petula Sadie by Clarks. Leather or nubuck upper with a cap toe. Breathable textile lining. Removable OrthoLite molded footbed with Clarks plush cushioning. Durable EVA outsole. Imported. Easy slip-on. Measurements: Heel Height: 1 1 2 in Weight: 10 oz Product measurements were taken using size 8, width B - Medium. Please note that measurements may vary by size. Weight of footwear is based on a single item, not a pair. The Pegg Abbie is part of the Clarks Collection. 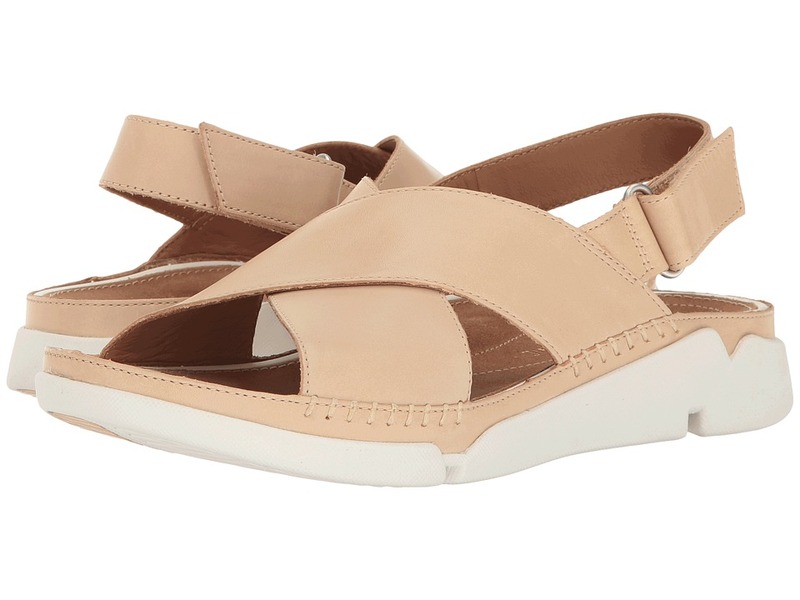 Keep it graceful with the Pegg Abbie slip-on from Clarks. Leather upper with stylish hardware accents for added appeal. Easy slip-on style. Soft textile lining. Cushioned Ortholite&amp#174 footbed for all-day wear. Cushion soft technology for added comfort. Durable rubber outsole. Imported. Measurements: Heel Height: 1 in Weight: 10 oz Product measurements were taken using size 8, width B - Medium. Please note that measurements may vary by size. Weight of footwear is based on a single item, not a pair. The Sillian Jetay is part of the Clarks Collection. 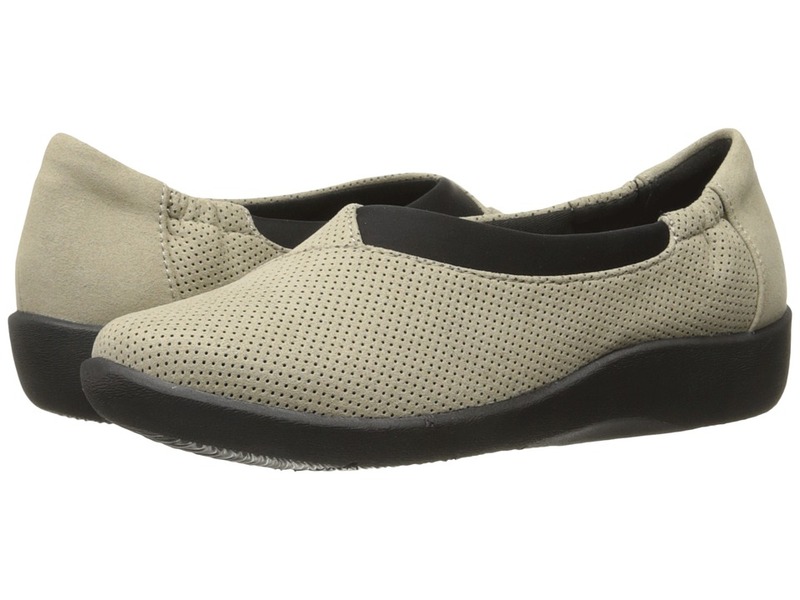 Enjoy relaxing comfort with the Sillian Jetay slip-on from Clarks. Synthetic nubuck upper. Easy slip-on style. Soft fabric lining. Cushioned Ortholite&amp#174 footbed for all-day wear. Cushion soft technology for added comfort. Durable rubber outsole. Imported. Measurements: Heel Height: 1 1 4 in Weight: 5 oz Product measurements were taken using size 7.5, width B - Medium. Please note that measurements may vary by size. Weight of footwear is based on a single item, not a pair. The Keesha Raine is part of the Clarks Artisan Collection. 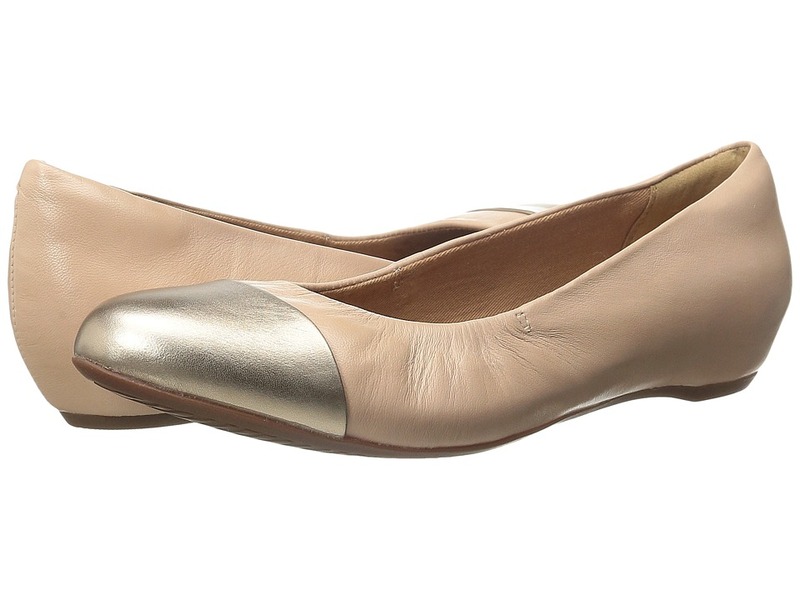 Create the ultimate polished look with the Keesha Raine flat by Clarks. 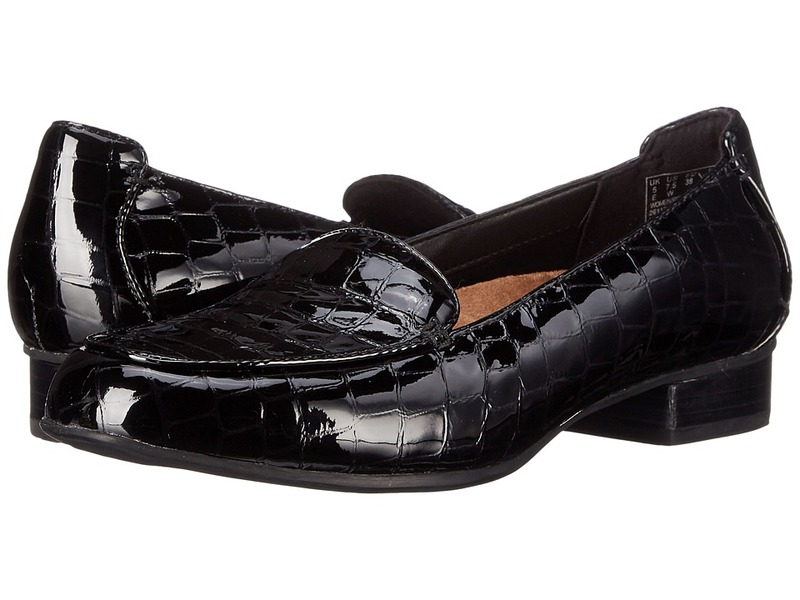 Patent, croc, or croc patent leather upper with a gold buckle. Easy slip-on style. Synthetic lining. 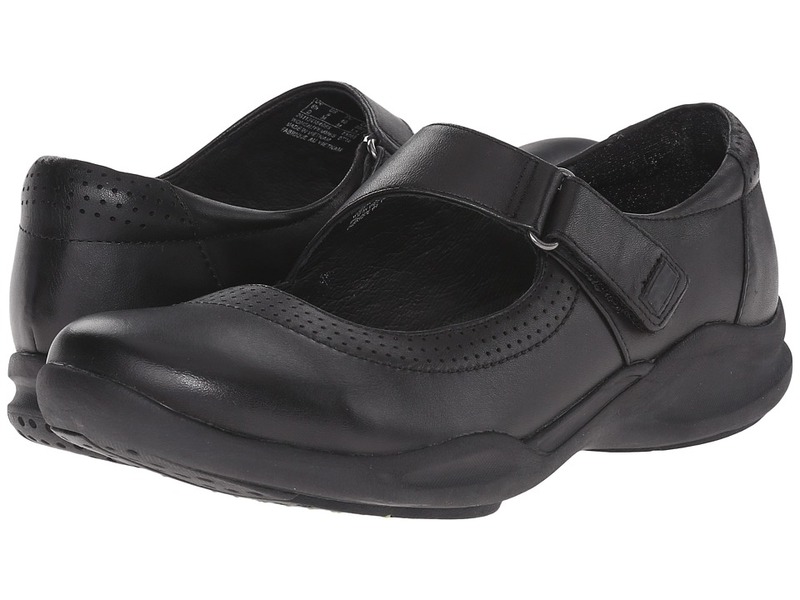 Clarks Plus intelligent underfoot cushioning with removable OrthoLite molded footbed. Durable rubber outsole. Imported. Measurements: Heel Height: 1 in Weight: 9 oz Product measurements were taken using size 9, width B - Medium. Please note that measurements may vary by size. Weight of footwear is based on a single item, not a pair. The Tri Alexia is part of the Clarks Artisan Collection. Embrace pure comfort and flaunt a fun new look by Clarks. 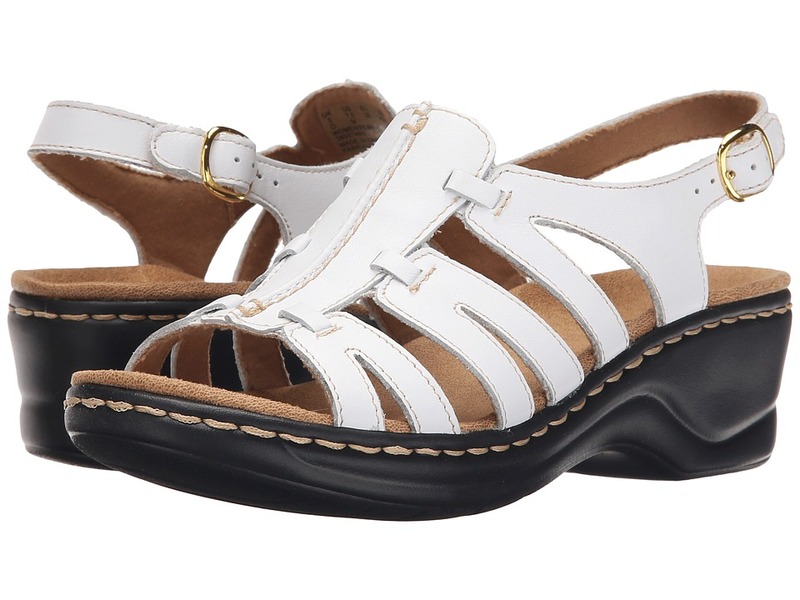 Leather upper with crisscross straps for added appeal. Hook-and-loop strap for an adjustable fit. Soft suede lining. Lightly cushioned footbed. Grooved Flex3 rubber outsole. Imported. Measurements: Heel Height: 1 1 4 in Weight: 6 oz Platform Height: 3 4 in Product measurements were taken using size 8, width B - Medium. Please note that measurements may vary by size. Weight of footwear is based on a single item, not a pair. Ensure exceptional comfort with the Funny Dream lace-up by Clarks. Leather upper. Lace-up closure. Soft leather lining. Cushioned insole. Curvy wedge sole with a TR outsole. Measurements: Heel Height: 1 1 4 in Weight: 10 oz Platform Height: 1 2 in Product measurements were taken using size 8.5, width B - Medium. Please note that measurements may vary by size. Weight of footwear is based on a single item, not a pair. The Wave Wish is part of the Clarks Wave Walk Collection. Out-walk your pals this season in the sporty Wave Wish by Clarks. Supple leather upper. Hook-and-loop strap. Leather lining. Removable OrthoLite footbed. EVA midsole. Features an innovative curved rocker sole that conserves energy, absorbs shock, and cushions the joints to enhance the walking experience. Measurements: Heel Height: 1 in Weight: 9 oz Product measurements were taken using size 9, width B - Medium. Please note that measurements may vary by size. Weight of footwear is based on a single item, not a pair. The Lexi Walnut Q is part of the Clarks Collection. 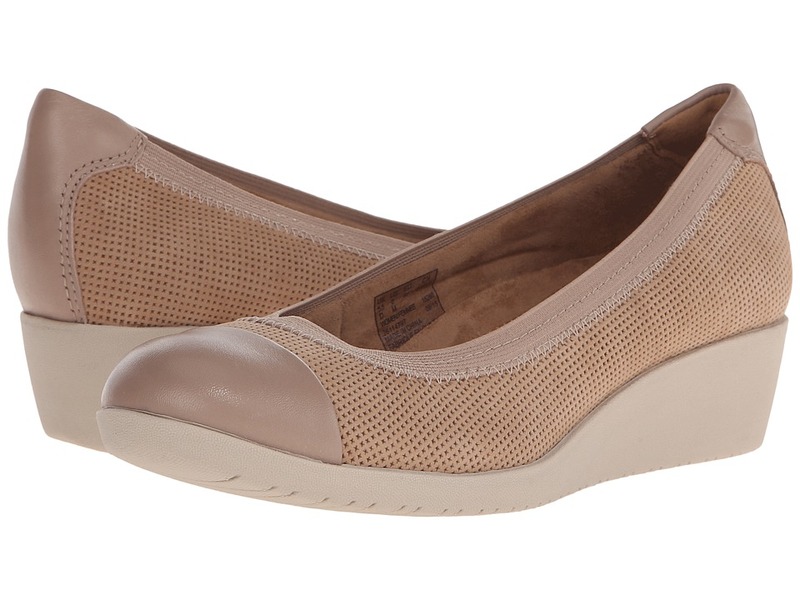 Slip on the Lexi Walnut Q for effortless style on summer weekend getaways or everyday errands. Leather upper with contrast stitching. Hook-and-loop strap for an adjustable fit. Fabric lining. Cushioned OrthoLite footbed. Lightweight EVA outsole. Imported. Measurements: Heel Height: 1 1 2 in Weight: 6 oz Platform Height: 1 2 in Product measurements were taken using size 7.5, width B - Medium. Please note that measurements may vary by size. Weight of footwear is based on a single item, not a pair. The Lexi Marigold Q is part of the Clarks Collection. Go for a look you desire in the flirty Lexi Marigold Q sandal by Clarks. Comes in a variety of leather or synthetic uppers with gladiator-inspired straps and contrast stitching. Material information is listed in the drop down when you select a color. Buckle closure. Soft fabric lining. Cushioned OrthoLite footbed with Soft Cushion technology for all-day comfort. Flexible rubber outsole. Measurements: Heel Height: 2 in Weight: 12 oz Platform Height: 1 in Product measurements were taken using size 10, width B - Medium. Please note that measurements may vary by size. Weight of footwear is based on a single item, not a pair. The May Marigold is part of the Clarks Collection. The May Marigold will carry you in comfort from season to season. Synthetic upper. Easy slip-on with goring. Soft fabric lining. 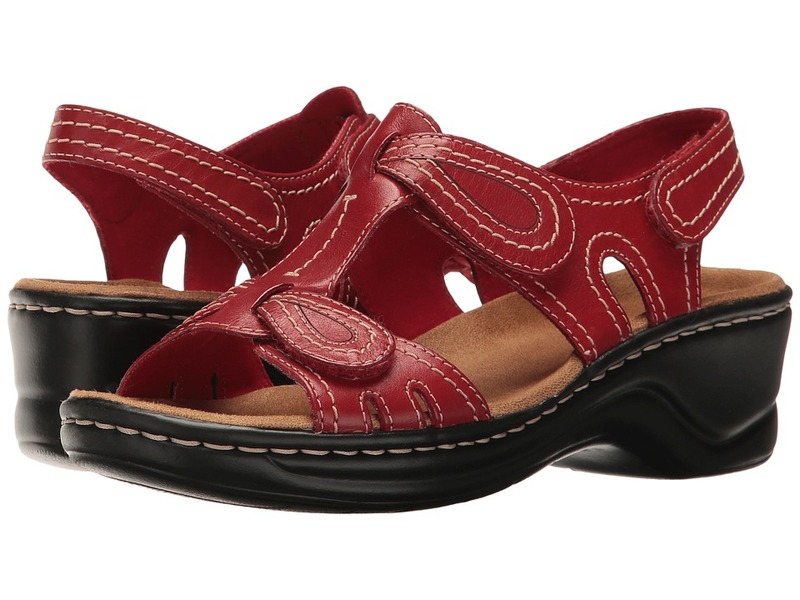 OrthoLite&amp#174 cushioned footbed. Durable TPR outsole. Imported. Measurements: Heel Height: 1 1 2 in Weight: 9 oz Product measurements were taken using size 7, width B - Medium. Please note that measurements may vary by size. Weight of footwear is based on a single item, not a pair. The Azella Revere is part of the Clarks Collection. The Azella Revere delivers a fresh take on a timeless summer style! Perf suede upper. 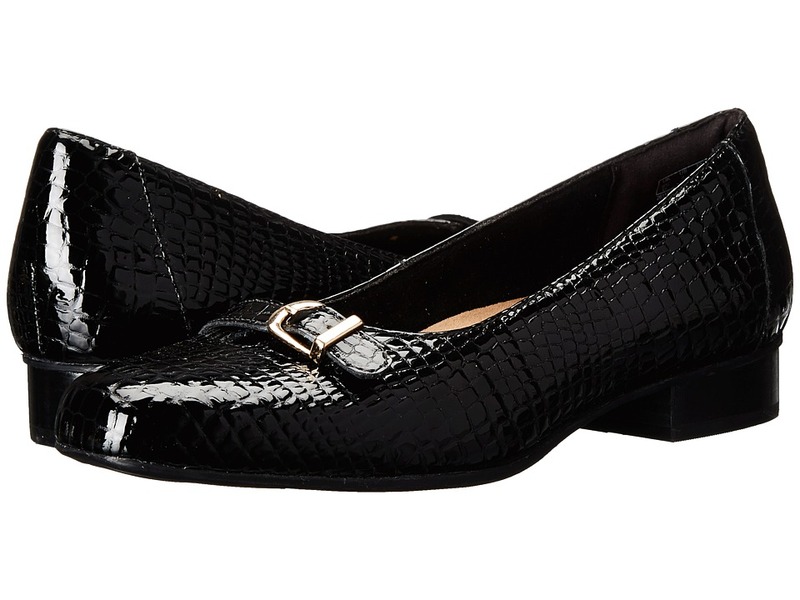 Easy slip-on with goring. Synthetic lining. Removable OrthoLite molded footbed with CushionSoft technology. Espadrille-wrapped midsole. Rubber outsole. Imported. Measurements: Weight: 13 oz Product measurements were taken using size 7.5, width D - Wide. Please note that measurements may vary by size. Weight of footwear is based on a single item, not a pair. The Alitay Susan is part of the Clarks Artisan Collection. The Alitay Susan is sure to flatter everything you wear from dresses to skirts to jeans! Leather upper with a cap toe detail. Easy slip-on style. Breathable leather lining. Cushion Plus with OrthoLite footbed for optimal comfort. Durable rubber outsole. Imported. Measurements: Heel Height: 1 in Weight: 12 oz Product measurements were taken using size 9, width B - Medium. Please note that measurements may vary by size. Weight of footwear is based on a single item, not a pair.